Skype Updated – With A Warning! 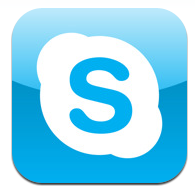 We have yet to see a iPad specific version of Skype released. If you don’t mind a pixelated app, you can have Skype on your iPad in 2x mode. It runs the same on the Wifi iPad as it does over Wifi on the iPhone so we have an option to call when we need it. The iPad’s that have 3G aren’t cell phone service rather only for data so it will be interesting to see if it get’s blocked in the future too. Either way, Wifi should continue to work for calling Skype-to-Skype so we will continue to chat with our friends and family… and coworders, overseas for free.